By Chris Williams on February 9, 2015. If there are actually holes or notched edges on the pages, or yellow stains, silverfish are the most likely culprits (see Damage to Books is Not From Booklice, Maybe Silverfish). Silverfish, like cockroaches, will feed on lots of different things, but they particularly like starchy materials. Books with sizing in the paper and glue in the binding fall into that category. What Does Silverfish Damage to Books Look Like? Silverfish usually graze on the surface of the paper. They especially like onionskin papers and glazed papers. Their rasping feeding will remove the glaze on the paper, leaving areas with a dull finish, perhaps removing words on the page. They can also chew irregular, notched holes in the paper. Their droppings and their body scales leave yellowish stains on the pages. If the damage matches silverfish damage, you’ll need to determine if it is old damage (maybe the books were already damaged when you received them), or if you have a current silverfish infestation. You’ll need to look through your books, ideally with the assistance of a pest control technician who can spot silverfish and their damage. Concentrate on books and materials that have been undisturbed for long periods of time, and on items that are in the dampest and darkest parts of the room. I’m assuming that the books in question are on shelves, but if they are in cardboard boxes, you’ll need to remove the books and destroy the boxes (boxes are a prime hiding place for silverfish). Since silverfish feed on a variety of materials, you’ll need to check items nearby as well. If the books are in an attic or other storage area, other boxes in storage may also be infested with silverfish. 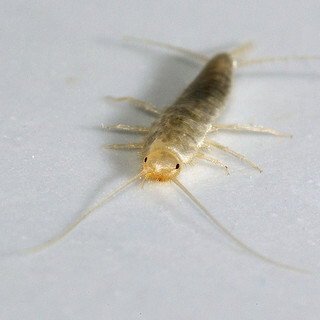 Work with your pest control professional to determine if certain areas need to be treated for silverfish. The exterminator can also advise you on how to treat the books themselves, if necessary.